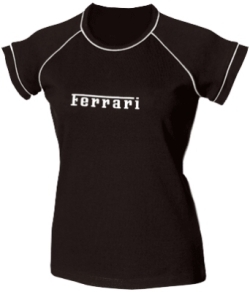 Black Reflective Ferrari Logo Ladies Skinny Shirt. Simple, stylish and easy to wear, this figure flattering ladies t-shirt is made of 100% cotton. Black with grey Ferrari logo on the front and contrasting, reflective, grey piping. Available in size 1 & 3 (M & XL).